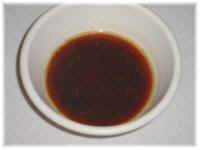 This is the gravy that's made when a piece of meat is seared very brown. It has a great taste along with the nice color. So when you hear the terms "brown the roast" you don't just get it brown, you sear it dark brown. This also holds true for all meats, ground beef included. 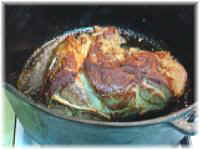 To the left is the gravy produced from a seared roast. No onions, no flour! I wish someone would invent smell-a-puter cause boy this is just nose tickling nice!! You should of course be careful not to burn the meat when searing.